The photo is an update on my Middagsfrid grocery service - this was the second dish I cooked, and although not photogenic, it was much better than it sounded on paper or looked on the plate. It's aubergine and mozzarella, in a tomato sauce. Pretty tasty - surprisingly, since I don't really like aubergine OR mozzarella. Black Currant and Nectarine Jam caught my eye, in one of our Swedish food mags. Sounds delicious! And it would go so well with these Pancake Muffins from Cupcakesfluffan, also in Swedish. It's kind of small, individual oven-baked pancakes. I think I'm going to love them, and they're perfect for my toddler, too. And then what looks like real indulgence - an almond tart from Chez Panisse, courtesy of David Lebovitz. Chez Panisse recently celebrated their 40th birthday, and he mentioned this recipe from his archives. I love caramel and almonds, so it's definitey something I want to try. 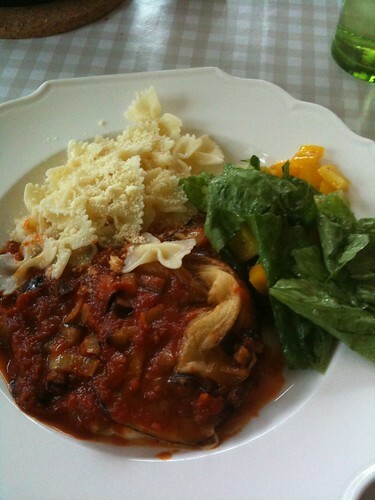 ahh you should try a Parmigiana to get over your aubergine/mozzarella issues!